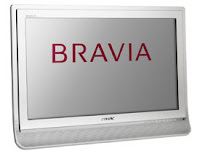 For those who wish they could take their LCD TV anywhere, the new Sony Bravia B4000 might be the answer to your prayers. The Sony Bravia B4000 Series is a different kind of LCD TV, starting from its color. While traditional LCD TVs are usually in black or silver, the Sony Bravia B4000 series comes in Pearly White and Glossy Mocha and screen sizes range from 20-inch, 23-inch and 26-inch. The Sony Bravia B4000 series has a handgrip on the back so you can easily move it around (really, now, who wants to move their TV around so much?. Features include up to 2 HDMI ports, built-in digital tuner, Virtual Dolby Surround and BBE ViVa audio signal processing, and of course, the Bravia Engine. No word yet as to when it will be available and the pricing but I got hold of this press release over at the Sony Europe website so I guess it's Europe first then rest of the world.